You might think the mighty t'internet would have killed zines stone dead. But they're not only alive, they're thriving. For the uninitiated, zines are low-fi, small print run publications, usually put together by a small number of enthusiasts in their sheds / bedrooms. If you can think of a topic, there's a zine that covers it. The fifth London Zine Symposium, taking place on Sunday just off Brick Lane, is a celebration of the wee zine and a chance for zine creators and readers to get together, buy and sell zines and generally have a chinwag. There'll be around 65 stalls plus workshops covering topics like zine politics, how to run zine libraries and festivals, as well as zine readings. You can even contribute to a collective zine on the day. Entry is free (but you can make a donation) so there's really no excuse for not sauntering down in the Bank Holiday sunshine and picking up some fine reading material. 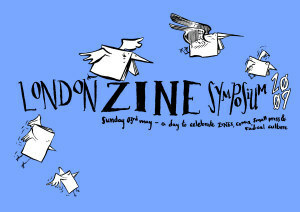 London Zine Symposium, 3 May 12-6pm, The Rag Factory, 16-18 Heneage Street E1. Free entry. For more information see the Symposium website.